When I reviewed Temples’ first album in last month issue, I mentioned the contemporary trend to a worldwide psychedelic music revival, well represented by artists such as Ty Segall or Foxygen. But this overview would be quite incomplete if I forgot to talk about the Australian scene, for it is probably at the other side of the world that the best modern psychedelic pieces of music can be found. Of course, the most characteristic figure of the movement would be Tame Impala (and more particularly singer-guitarist-songwriter-producer and music stakanovist Kevin Parker), who can boast about having released one of the most important album of the last decade: ‘Lonerism’. 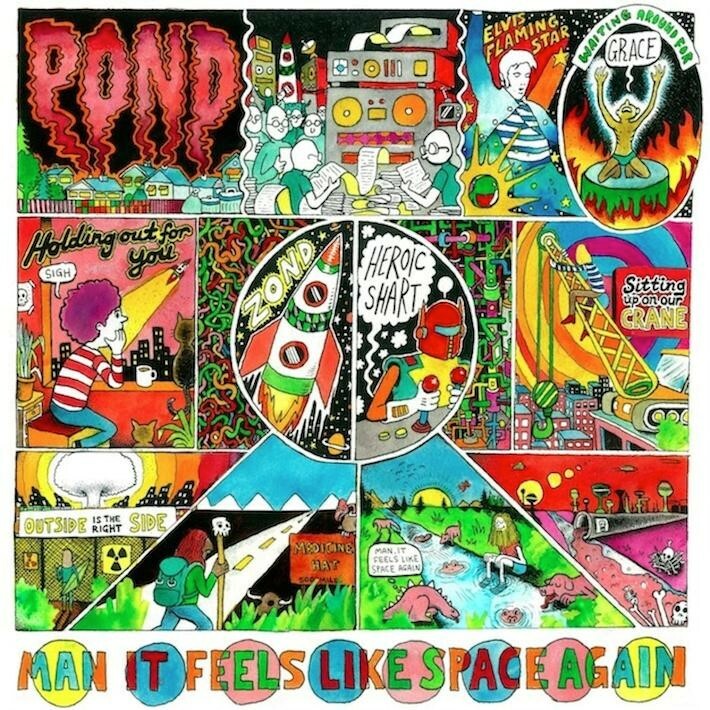 No wonder why so many new formations revolved around the Perth-based heroes, including Pond. In fact, Pond’s case is rather special, since almost all the members are also part of Tame Impala. In that sense, the band could be defined as Tame Impala’s crazy shambolic brother. And that’s definitely what stands out from this ‘Man It Feels Like Space Again’. If the influence of Tame Impala is there (multiple synthesiser strats, vocals full of reverb, constant breaks…), the whole remains rougher (like the early Syd Barret’s work with Pink Floyd), which confirms this feeling of intersidereal delirium. The low-cost videos and the album’s cover tell a lot about its content and are the promise of a blissful mess full of rockets, hippies and dinosaurs! he record begins with ‘Waiting Around For Grace’ and its synthesiser/vocals introduction, before definitively taking off into a psychedelic-pop gem. As for ‘Elvis’ Flaming Star’ and ‘Zond’, they have a massive dance potential (with the help of some special substances obviously). But Pond is also at ease when it comes to calm and gliding songs, as demonstrated by the restful ‘Holding Out For You’ and the wonderful ‘Medicine Hat’, built on a simple, yet emotional, series of acoustic chords. ‘Heroic Shart’ (fancy title, isn’t it?) is another proof of the very serious tonne of the song writing, while ‘Outside Is The Right Side’ is a funky killer, with a totally out of control wah-wah pedal that would make Mark Ronson’s last album pass for a nice effort! All of this leading to the final explosion, an epic 8-min long ‘symphony’ that gave its name to the album.